The bed mattress can easily be stained especially if you have small children, animals, or if are used to eat in bed. Accidents can easily happen. And when it comes to the mattress, the stains seem difficult to remove. But, there are some clever tricks that you can call with confidence. If you spilled coffee, water or any other liquid on the mattress, the first step is to sprinkle over the stain some baking soda. It will quickly absorb the impregnated liquid between the tresses. Then remove the baking soda, and if it’s necessary, repeat the procedure. Ammonia is one of the best solutions you can call with confidence to get rid of the stains on the mattress. To 1 liter of warm water, add a few drops of dishwashing detergent and a cup of ammonia. Mix well the solution. Soak in this solution a cotton cloth or a sponge and wipe the stained surface. In the case of old stains, let the cloth soaked in this solution to act over the stain for 5 minutes, then rinse the cloth, dip it again in the solution, and rub well the stained areas. Don’t forget to squeeze the cloth very well, because it has to be damp. Careful! If you use this technique, it’s recommended to use protective gloves and open the window not to inhale ammonia vapors. Vinegar is another handy solution for many people. It is useful in removing stains and, in addition, eliminates unpleasant odors. 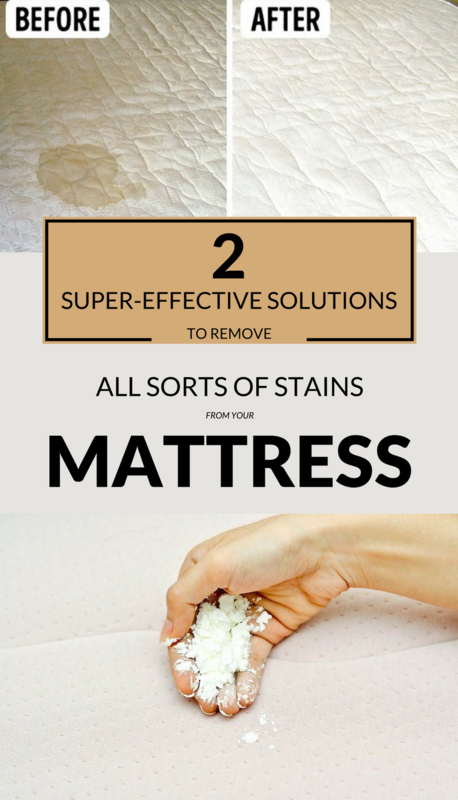 Using a sponge or a cloth soaked in the solution, clean the mattress well, insisting on the stain. Finally, wipe the mattress with a clean cotton cloth that absorbs the excess liquid. Open the windows and ventilate the room, letting fresh air to penetrate into the room and allow the mattress to dry faster.